When My Children Were Young"
Would you want to raise your child as a perfect target for a child molester? If so, then this is the book for you. The ideal child victim, from an abuser's perspective, will put up with whatever the abuser does to them without saying 'no' or resisting or complaining in any way. Such a child will do whatever they are told, put up with any kind of touch from an adult, regardless of how icky it might make the child feel. And when commanded to keep the abuse a secret, they will obey, because they have been trained all their short life to do little else. No sexually exploitive adult possibly hope for a more ideal victim than a child raised the Reb Bradley way, as set out in his 2002 book, Child Training Tips: What I Wish I Knew When My Children Were Young. 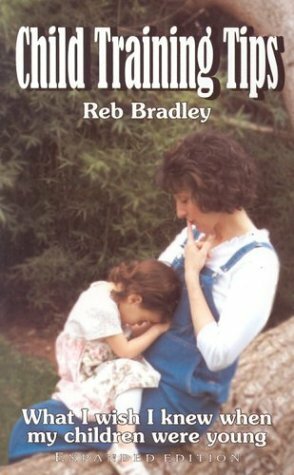 Early on, Reb Bradley makes clear that every parent has a duty to crush the child's very sense of who they are. This presumably is a worthy goal because it makes willful disobedience impossible. "They can learn as early as possible to die to themselves," he writes on p. 35. "While being held in their parent's arms a toddler struggles to get down." "The child moves his shoulder away when a parent reaches out to touch or embrace him." After being placed on their parent's lap, they attempt to get off." A preschooler saying "'But I don't want a shower. I don't want a shower' when he's being given a shower." Parents are exhorted not to "allow children to freely express their opinions, complaints, and criticisms regarding family decisions." The message to the child comes through loud and clear. We own you. You have no boundaries which we cannot violate whenever, wherever, and as often as we please. Not only may you not resist us when we violate your boundaries, you will also be severely punished if you so much as verbally communicate your discomfort when we do so. And when we treat you this way, you must smile and pretend to enjoy our actions. In the world of Reb Bradley the "rules" involve complete disrespect for a child's bodily integrity and physical boundaries; the "rules" explicitly strive to force the child to "die to themselves" at the earliest age possible. When severe whippings with rods are used to enforce such "rules" beginning very early in life, one most definitely has an abusive situation. This is the Abu Graib approach to parenting. So, if you want to raise a child who will not love you, but who will passively cooperate with whatever a child molester orders them to do, then please buy this book and follow its advice to the letter. Otherwise, take this despicable book and toss it, not into the trashcan but into the recycling bin. That way the tree which died to make its pages will not have perished entirely in vain.